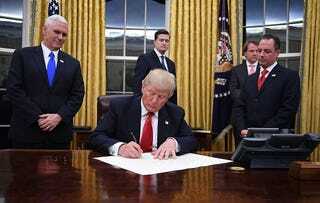 Donald Trump’s very first executive order as president promised “to seek the prompt repeal” of the Affordable Care Act, President Barack Obama’s signature health care law. Within hours of assuming the office of the presidency Friday—between his swearing-in and before leaving for his inaugural balls—Trump signed the executive order, which did not give specifics on how to actually change Obamacare. CNN reports that the act does not itself change the law; it allows parts of the ACA to be loosened before Congress can fully repeal it. The one-page, multipart order directs the secretary of health and human services, as well as heads of other agencies, to interpret regulations as loosely as allowed to minimize the financial burden on individuals, insurers, doctors and health care providers. One way that the law could be interpreted could affect the “individual mandate,” which requires most Americans to be insured or pay a penalty unless they can prove a financial hardship. The Trump administration may loosen the criteria for “financial hardship” so that fewer would pay the penalty, reports CNN. The order also looks to give states more flexibility and control over their health care markets and to allow insurers to offer policies across state lines, long-held Republican ideals. There is currently no Republican alternative to Obamacare, though Trump has also said that he is nearly done working on a replacement proposal. Republican leaders in Congress, however, have said that they have not been consulted. Read more at CNN and the New York Times.